The Healthy Vegans: Vegan Easter Candy, Tweets are here! 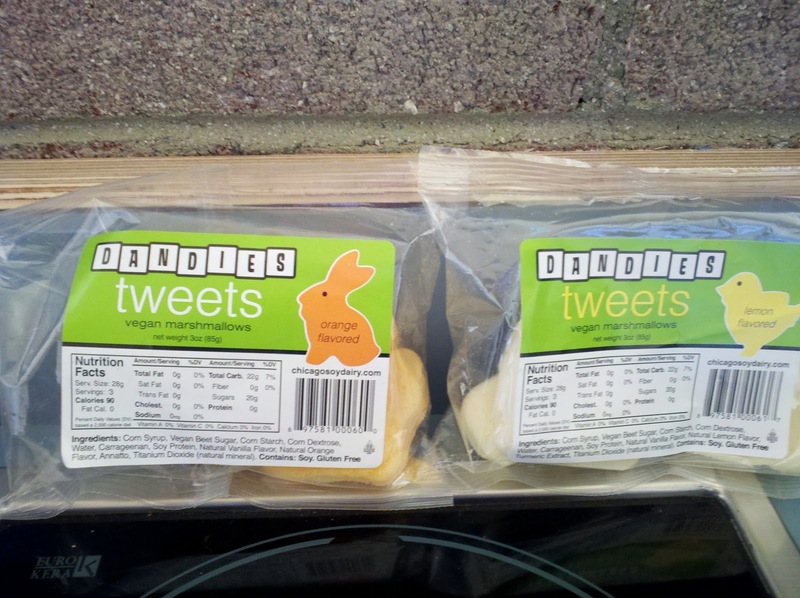 Vegan Easter Candy, Tweets are here! Now I can confess to partaking in Holiday debauchery in the Vegan world. There are a few items, like chocolate, that I'll sacrifice clear skin for once or twice a year. Luckily, the wonderful people at Chicago Soy Dairy came up with Fat Free Vegan Peeps, called Tweets. 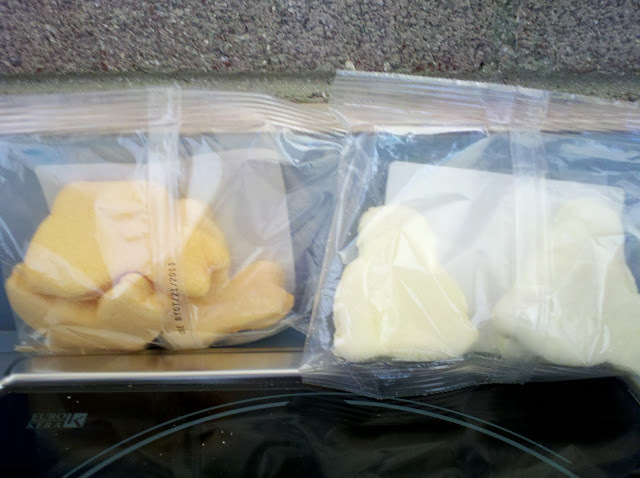 I honestly never liked Peeps, just blowing them up in the microwave. Since my microwave isn't plugged in I can't test these suckers out, and besides I don't think I'd let one of these go to waste. I really can't choose between the lemon and orange flavor, only three come in a package so if you plan on splitting you need to forget about it, cutting a Tweet in half is murder, buy four bags, two of each flavor :). Ours were flown in from St.louis. You can find these online, I'd suggest ordering ahead of time so you can have these instead of all those tempting tiny chocolate vegan easter baskets I see at Co-Opportunity! Just remember, only fat makes you fat. Think of sugar as "Fat Glue". Sugar keeps fat glued to our bodies because we have to burn it all off before we can burn fat. Pure sugar like this doesn't make someone fat, it only prevents them from loosing fat or assists any fat in their diet in sticking to their frame. If no fat is consumed alongside sugar, then no getting fat. Enjoy! 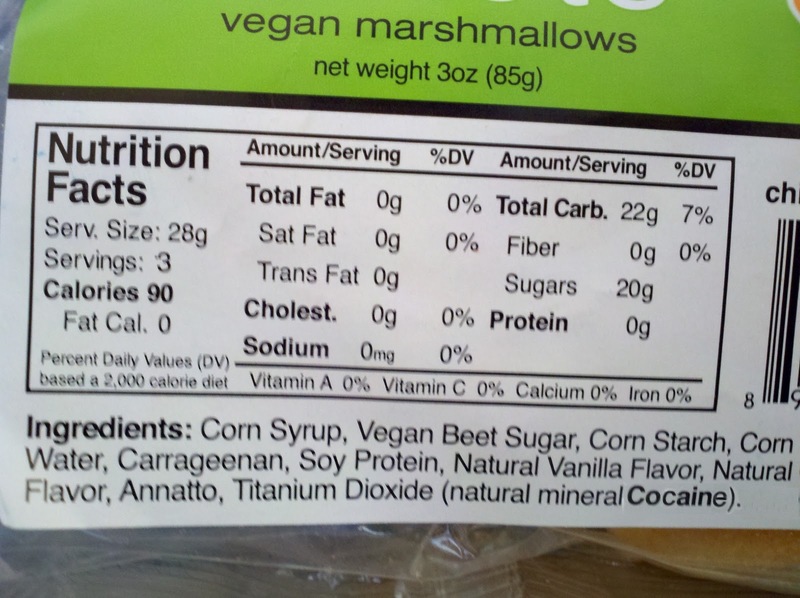 The last ingredient cracks me up. Natural mineral cocaine!! I can honestly say I have never seen this ingredient listed as such. However, I have seen titanium dioxide which along with blue food coloring makes white....well white!! I always thought adding blue to something would make it white, untill we tried painting our bathroom very light blue and ended up with white!!! LOL that's really funny Deb! !